The transcription factor AP1 mediates long-term plasticity in vertebrate and invertebrate central nervous systems. Recent studies of activity-induced synaptic change indicate that AP1 can function upstream of CREB to regulate both CREB-dependent enhancement of synaptic strength as well as CREB-independent increase in bouton number at the Drosophila neuromuscular junction (NMJ). However, it is not clear from this study if AP1 functions autonomously in motor neurons to directly modulate plasticity. Here, we show that Fos and Jun, the two components of AP1, are abundantly expressed in motor neurons. We further combine immunohistochemical and electrophysiological analyses with use of a collection of enhancers that tightly restrict AP1 transgene expression within the nervous system to show that AP1 induction or inhibition in, but not outside of, motor neurons is necessary and sufficient for its modulation of NMJ size and strength. By arguing against the possibility that AP1 effects at the NMJ occur via a polysynaptic mechanism, these observations support a model in which AP1 directly modulates NMJ plasticity processes through a cell autonomous pathway in the motor neuron. The approach described here may serve as a useful experimental paradigm for analyzing cell autonomy of genes found to influence structure and function of Drosophila motor neurons. Long-term forms of synaptic plasticity are distinguished from transient short-term forms by a requirement for new gene expression . The nature of the transcriptional switch that interprets and responds to synaptic signals that trigger persistent changes to synapses, remains intensely studied but yet poorly established. In the consensus model, ERK-dependent phosphorylation of CREB initiates CREB-dependent transcription of a first wave of immediate early genes including transcription factors such as Fos and Jun that dimerize to form AP1. Immediate-early transcription-factors, either independently or in collaboration with CREB, then regulate waves of gene expression that underlie persistent changes in synaptic strength and architecture. Such a model is supported by dramatic demonstrations of the effects of CREB activation on enhancing forms of long-term memory [2, 3] and synaptic plasticity [4, 5]. The generality of the CREB-switch model has been specifically questioned by two previous studies at the Drosophila motor synapse. 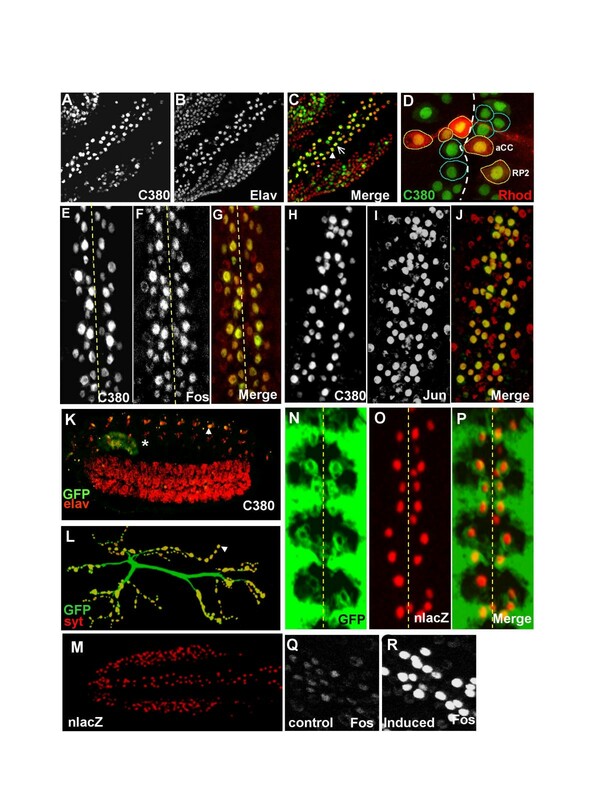 These studies indicate that CREB is dispensable for the activity-dependent modulation of bouton number at the Drosophila larval NMJ , a process that shares compelling mechanistic similarities to morphological changes required for long-term facilitation in Aplysia. Because activity-induced synaptic growth in Aplysia requires new neuronal gene expression , it was likely that a yet-to-be-identified transcription factor acted to control a CREB-independent gene expression module required for synaptic growth. A recent study suggests that this transcription factor may be AP1 , a transcription factor previously shown to be CREB responsive [9–11], essential for some forms of long-term memory [12, 13], and for long-term cocaine sensitization . This recent analysis shows that AP1 activity in the Drosophila CNS, under regulation by endogenous JNK signalling, regulates both bouton number and synaptic strength at the larval motor synapse. AP1-mediated synaptic growth occurs through a mechanism independent of CREB; however, AP1-mediated increase in synaptic strength (evoked transmitter release) requires CREB. Increased levels of CREB mRNA detected in heads of Drosophila after a brief induction of AP1, suggested that AP1 may act upstream of CREB and that AP1 activation may be sufficient to induced CREB dependent and CREB-independent aspects of plasticity . While provocative, these analyses did not exclude the possibility that AP1 expression in modulatory neurons affect motor synapse plasticity by trans-synaptic signalling mechanisms. Here we present a detailed analysis of the cell autonomy of AP1 functions. Using well characterized markers for motor neurons, and previously reported motor-neuron restricted enhancers carefully documented here, we present new lines of evidence in support of a model in which AP1 functions in the motor neuron and regulates NMJ plasticity via its effects on gene expression in the motor neuron. For AP1 to function in motor neurons, both of its constituent subunits, Fos and Jun, must be expressed in these cells. We localized the proteins to motor neurons relative to specific markers. The X-chromosomal C380 enhancer in particular has been reported, based on unpublished observations, to specifically mark embryonic and larval motor neurons [15–17]. To confirm and document the expression pattern of this enhancer, we visualized cells in the Drosophila CNS labelled by C380 driven nuclear green fluorescent protein (NlsGFP). In the ventral ganglion of III instar larvae C380 appeared highly selective in expression, marking only a subset of cells per hemisegment cells from a large field of neurons identified using the pan-neuronal marker Elav (Figures 1A,1B and 1C). In the medial, dorsal surface of the ganglion, that contains identified RP and aCC motor neurons , C380 drives GFP reporter expression in 5 of 6 neurons that could be detected in each hemisegment (the neuron not labelled by C380 is indicated by an asterisk in Figure 1C). Away from this medial zone, in the lateral zones, several cells marked by C380 appeared negative for Elav staining (Figures 1A,1B and 1C). Fos and Jun are expressed in motor neurons marked by the C380 enhancer. In third-instar larval ventral ganglia, C380 enhancer-driven nuclear GFP (A) marks the dorso-medial cells labelled with the neuronal marker Elav (B and C) and (D) by retrograde fills of the motor nerve (cells circled by a yellow line; cells with a green boundary represent the complementary neurons on the adjoining hemisegment). An arrowhead marks RP2 and an arrow marks aCC in 1C. An asterisk marks a dorsal medial neuron not labelled by C380. Both Fos (F) and Jun (I) are expressed strongly in medial motor neurons marked by the C380 enhancer (E and H). Figure 1G and 1J are merged images of the above showing Fos and Jun expression in identified C380 positive motor neurons. Fos and Jun are also expressed at lower levels in other neurons and non-neuronal cells including CNS glia (not shown). 1K shows a stage 15 embryo expressing C380-Nls-GFP (green) counterstained with anti-elav (red) to mark all differentiated neurons. GFP expression is only seen in PNS neurons (arrowhead) and in salivary gland (asterisk). C380 driven GFP can be detected at high levels at motor synapses in the third instar larva such as that on muscles 6 and 7 (L). The synapse is counterstained with anti-synaptotagmin to mark synaptic boutons (arrowhead). Figure 1M shows a third instar ventral ganglion stained for nuclear lacZ. This expression pattern closely mimics that of C380-GAL4. In this animal, lacZ is expressed from an actin promoter only in cells in which "flip-out" of a stuffer DNA has occurred due to C380-GAL4 driven UAS-FLP. Figure 1N shows C380 driven membrane bound cd8-GFP expression in the dorsal medial region of a third instar ventral ganglion. 1O shows n-lacZ in the same animal and 1P is a merged image showing that n-lacZ is expressed only in the motor neurons that are also positive for C380 expression at this developmental stage. 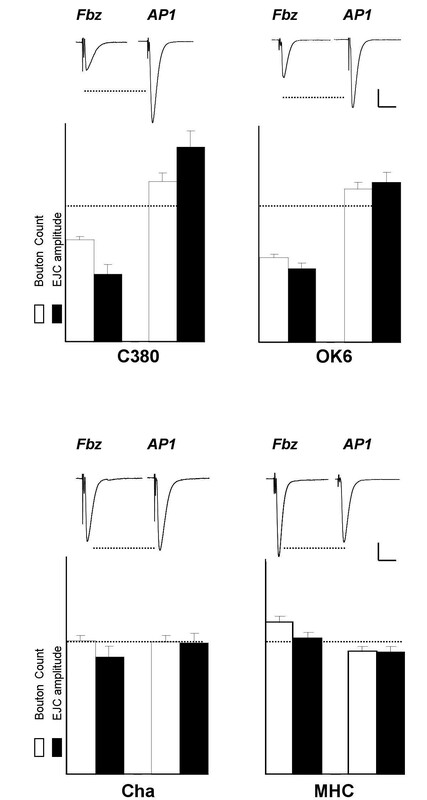 The specificity of the Fos antibodies is shown by increased immunoreactivity in motor neurons when AP1 is expressed under control of the C380 enhancer (Q and R). The dashed yellow lines in all cases approximately mark the midline. We positively identified all 5 medial, C380-expressing cells as motor neurons using two lines of evidence. First, the aCC (arrow in Figure 1C) and RP2 (arrowhead in Figure 1C) motor neurons identified by anti-Eve staining  were among the 5 C380 expressing neurons (data not shown). Second, and more conclusively, Rhodamine-dextran backfills of the entire peripheral nerve bundle (including both the ISN and SN) that innervates abdominal segment A6 clearly marked 5 medial motor neurons per hemisegment. Of the three contralateral MNs, two are RP3 and RP5; the two ipsilateral ones are aCC and RP2 [18, 19]. In double "stained" preparations, these same 5 cells are also marked by C380 reporter expression (Figure 1D). C380 driven soluble GFP, beautifully labelled presynaptic nerve terminals on the larval body wall muscle further confirming expression in the large majority of motor neurons in the central nervous system (Figure 1L). To assess the time at which C380 expression starts, we stained C380-GAL4; UAS-NGFP embryos at various stages with anti-elav to mark differentiated neurons (Figure 1K). GFP expression in the CNS starts at very late stages (beyond stage 17, data not shown) in embryogenesis and there is no discernible GFP expression even at stage 15 by which time motor neuron differentiation has already taken place. This suggests that in our experiments, AP1 activation or inhibition in differentiated motor neurons is sufficient to cause changes at their synapses. To further test if C380 expression in embryonic stages or earlier larval instars occurs transiently in a broader domain, we did the following experiment. C380; UAS-cd8GFP males were crossed to virgin females containing UAS-FLP and actin-FRT-raf-FRT-n lacZ. In the progeny, cd8-GFP would report current C380 expression. On the other hand, any cell that has seen significant GAL4 expression during the development of the animal, would express the flippase recombinase. In such a cell, the stuffer raf fragment would be excised out using the flanking FRT sites, leading to nuclear-lacZ expression from the actin promoter . Figure 1M shows the general expression of nlacZ in a third instar ventral ganglion from such an animal. This expression pattern, a memory of GAL4 expression through development, is highly reminiscent of the C380 profile. Figure 1N,1O and 1P show a close-up of the dorsal medial region. All motor neurons that are labelled with cd8-GFP also have strong nlacZ labelling. Taken together, these results strongly suggest that the C380 expression in motor neurons occurs after their differentiation and in a profile that is stable through development. Using affinity-purified antibodies against the respective proteins , we discovered strong expression of Fos and Jun in dorsal motor neuron clusters marked by C380 expression (Figures 1E,1F,1G,1H,1I,1J). While the proteins were also found in most other neurons and in glia, expression in motor neurons was particularly strong. The specificity of the antibody and the effectiveness of C380 in driving Fos and Jun expression are both demonstrated by dramatically increased Fos and Jun immunoreactivity in neurons of flies overexpressing AP1 (eg. Figures 1Q and 1R). Thus, Fos and Jun are well positioned for autonomous function in presynaptic plasticity of the Drosophila NMJ. In addition to C380 at least two other enhancers have value for restricting transgene expression to (or excluding expression from) motor neurons (Figure 2). The OK6 enhancer line has been recently reported to be motor neuron specific . In contrast, the recently mapped cholineacetyltransferase (Cha) promoter labels cholinergic neurons and may be expected to exclude motor neurons [23, 24]. Relatively strong expression of this enhancer in the nervous system is argued by the observation that it causes a strong loss-of-function phenotype when used to drive a dominant-negative shibirets transgene . We used methods similar to those used for analysis of C380 to confirm the expected patterns of expression for these enhancers. The OK6 enhancer is predominantly restricted to motor neurons while the Cha (cholineacetyltransferase) enhancer is largely excluded from these cells. 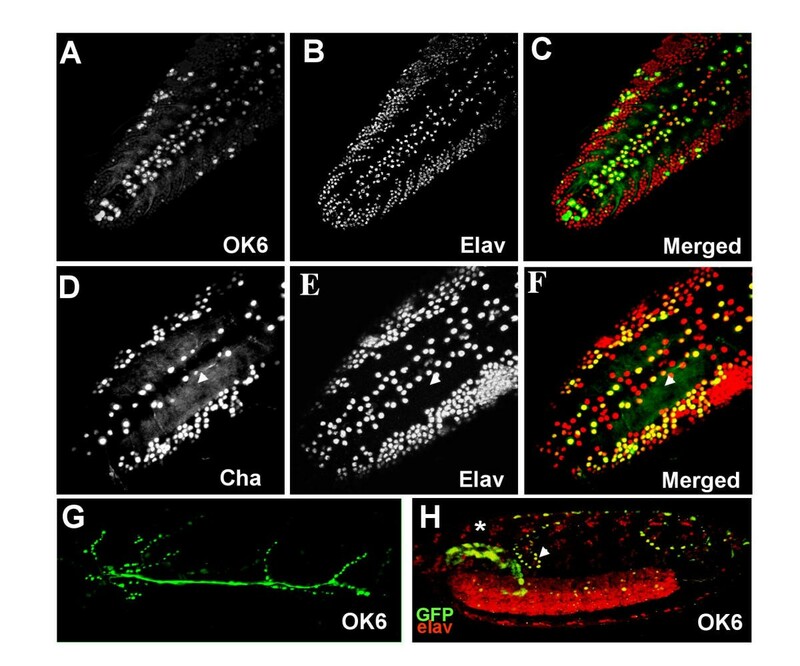 Images of ventral ganglia double labelled to reveal OK6 enhancer driven nuclear GFP (A) and Elav-expressing neurons (B). Similar images of ventral ganglia processed to compare Cha-driven n GFP (D) with Elav-labelled neurons (E). Cha-GAL4 expression in aCC neurons is shown by an arrowhead in 2D, E and F. Neuromuscular junctions (muscles 6 and 7) of animals expressing GFP under OK6 control show strongly fluorescent motor terminals (G). Figure 2H shows a stage 15 embryo expressing nuclear GFP driven by OK6-GAL4, counterstained with anti-elav to mark all differentiated neurons. GFP expression is only seen in salivary gland (asterisk) and some non-neuronal cells (arrowhead). OK6 driven green nuclear fluorescent protein (GFP) labelled medial motor neurons previously identified with C380 (Figures 2A,2B and 2C); the identification of these cells was unambiguous. However, motor neuron expression was further confirmed by strong labelling of motor terminals by OK6 driven GFP marker (Figure 2G). OK6 expression in the rest of the ventral ganglion appeared distinct from and sparser than that observed with C380 (Figures 2A,2B,2C). In these animals, similar to C380, expression does not start until very late in embryogenesis. Figure 2H shows a stage 15 embryo expressing NGFP driven by OK6-GAL4, counterstained with anti-elav. Apart from expression in the salivary gland (asterisk) and some non-neuronal cells (arrowhead) expression of GFP in the CNS is completely absent. In contrast to OK6, the Cha promoter predominantly labelled cells in the lateral region of the ventral ganglion (Figure 2D,2E and 2F). Additional expression was observed in two neurons in the region of the medial motor neuron cluster. One of these is aCC as it is marked by anti-eve antibodies and is also labelled by backfills from motor axon bundles (data not shown). The other neuron is most likely an interneuron as it is not labelled by the backfill and is also excluded from C380-nlsGFP expressing ganglia. Additionally, Cha-driven GFP did not label motor terminals on muscles 6 and 7 (data not shown) indicating that even if it were expressed in some motor neurons, it was excluded from the motor neurons innervating ventral longitudinal muscles. Together, these analyses of C380, OK6 and Cha expression allow us to reach the following conclusions. First, C380 and OK6 are each expressed in a small fraction of neurons in the CNS. Both C380 and OK6 are expressed in larval motor neurons, particularly in those that innervate the ventral longitudinal muscles 6 and 7. Secondary expression in non-motor neurons, not excluded by our analyses, appears to be both limited and largely non-overlapping between C380 and OK6. The Cha promoter on the other hand is not expressed in the vast majority of motor neurons but nevertheless is strongly expressed in a significant fraction of the central nervous system. Previous analyses showing that pan-neural perturbations of AP1 influence both motor synapse number and strength, do not rule out the possibility that the observed effects of this transcription factor on motor neuron plasticity occur via a polysynaptic pathway. If AP1's effects on presynaptic plasticity were cell autonomous, then these effects should be observed by AP1 perturbation specifically in motor neurons but not following similar perturbation of AP1 function outside of these cells. Our analysis of changes in bouton number and evoked transmitter release induced by C380-driven or OK6-driven dominant AP1-transgenes is completely consistent with cell autonomous effects (Figure 3A,3B, Table 1). C380-driven Fos inhibitor (FBZ) reduces synaptic strength to about 50+/-7% and bouton number to 75+/-3% of control animals. Thus, AP1 activity is required in C380 positive cells for normal developmental plasticity. More striking, C380-driven wild-type AP1 increases synaptic strength to 143+/-12% and bouton number to 123+/-5% of control. These results, significant to better than 99% confidence, are comparable to or, in some cases, more robust than, what we have previously reported for effects of pan-neural, elav (C155) enhancer driven expression of these same AP1-perturbing transgenes . The conclusion from this experiment, that AP1 functions autonomously in motor neurons to regulate both structural and functional aspects of presynaptic plasticity is limited only by potentially important contributions of AP1 perturbation in C380 expressing cells that are not motor neurons. AP1 effects on NMJ plasticity are tightly correlated with motor neuron expression. Upper panel shows the effect of inhibition or activation of AP1 in motor neurons using two different motor-neuron GAL4 drivers, C380 and OK6. Representative EJC traces are also shown to highlight the contrasting results of AP1 inhibition or activation. The lower panel shows that similar manipulations in either non-motor neurons (ChaGAL4) or post-synaptic muscle (MHCGAL4) has minimal effects on synaptic plasticity. Dotted lines represent control levels (for actual values see Table 1). Scale bar: X-axis = 20 msec and Y-axis = 20 nA. AP1 effects at the larval neuromuscular junction derive from its action in motor neurons. GAL4 drivers that include expression in motor neurons (C155, C380 and OK6) alter synaptic plasticity through either inhibition (FBZ) or activation (AP1) of AP1. Non-motor neuron drivers (Cha) or post-synaptic muscle drivers (MHC) do not achieve this effect. All numbers are raw values (+/- SEM). Numbers in the top left corner of each box are number of animals analyzed in each case. Numbers for C155 are reproduced from Sanyal et al., 2002. Abbreviations: EJC stands for evoked junctional current amplitude, mEJC for miniature evoked junctional current amplitude, and QC is quantal content of the evoked response. To address this caveat, we analyzed effects of OK6 driven, AP1-perturbing transgenes on motor synapse plasticity. Results from these experiments were completely consistent with predictions based on the analysis of C380. OK6-driven FBZ expression resulted in a mean EJC amplitude 55+/-4% and a synapse size 63+/3% of wild type. OK6-driven AP1 expression caused the expected increase in size and strength (EJC was 119+/-7% and synapse size 114+/-5% of wild type). The relatively mild effect that OK6-driven AP1 has on synapse growth and strength may be explained by lower activity of the OK6 enhancer. However, the effect is unequivocal (p < 0.006 for synapse size and <0.01 for EJC) and consistent with analysis of C380 driven or pan-neural expression of AP1. We performed additional experiments to confirm that induction of AP1 perturbing transgenes in cholinergic CNS neurons did not alter synapse size or strength at the NMJs on muscles 6 and 7 (Figure 3C, Table 1). ChaGal4 driven AP1 inhibitory and inducing transgenes had no effect on bouton number or synaptic strength at the larval nmj. In percent of control, values of synaptic strength and bouton number for ChaGal4 FBZ are 99+/-4% and 90+/-8%, and for ChaGal4 AP1, 98+/-5% and 97+/-7%, respectively. We had previously reported, based on unpublished observations, that postsynaptic expression of AP1 modulating transgenes did not alter motor neuron plasticity . Results for consequences of expressing FBZ or AP1 in muscle through the Myosin Heavy Chain enhancers are shown in Figure 3D and Table 1. Muscle expression of FBZ resulted in bouton number and EJC amplitudes of 113+/-5% and 102+/-4%, statistically indistinguishable from the control NMJs. Similarly, muscle expression of AP1 gave values of 92+/-4% for bouton number and 93+/-4% for EJCs. These results further restrict the range of cells in which AP1 must function in order to influence motor synapse plasticity. While the role of neural activity, cAMP, adenylate cyclase, ERK, CREB and AP1 in Drosophila NMJ plasticity has been extensively analyzed [6, 8, 16, 26, 27], the cells in which these regulatory molecules must function for synaptic plasticity have generally not been clearly identified. Here, using an approach that could be usefully adapted for analysis of other components of synaptic plasticity, we provide a compelling argument for a model in which AP1 functions cell autonomously in motor neurons to regulate NMJ plasticity in Drosophila. Caveats to this conclusion derive from uncertainties intrinsic to the use of specific neuronal enhancers to address issue of tissue or cell specificity. Our analyses of the expression patterns of two enhancers unambiguously establish several important points. Both C380 and OK6 are highly expressed in motor neurons [16, 17, 22]. Secondary expression of these enhancers outside of motor neurons, if present, is first limited and second quite different for the two enhancers (Figures 1 and 2). Thus, common phenotypes caused when AP1 transgenes are expressed by either OK6 or C380 likely result from expression in the neurons positive for both enhancers, i.e. the motor neurons. It is necessary to acknowledge that our analyses of the expression patterns for C380 and OK6, being confined to the III instar larval stage, do not in themselves rule out the possibility that these enhancers are transiently turned on, at earlier stages of development, in critical neurons that modulate plasticity processes in motor neurons. While this remains a formal possibility, it seems unlikely for three reasons. First, our experiment with actin<raf<nlacZ to visualize the history of GAL4 expression in C380 animals shows that it is quite stable and similar to the final expression pattern seen in the third instar ventral ganglia (Figure 1M,1N,1O,1P). Second, because GFP is a notoriously stable reporter molecule  we would expect even biologically transient enhancer activity to be revealed by stable reporter expression. Third, both OK6 and C380 enhancers become active relatively late in embryogenesis (Figure 1K and 2H) and their expression patterns in embryos is highly similar to that observed in third-instar larvae (data not shown). A cell-autonomous function for AP1 in motor neurons is also supported by two further lines of independent evidence. First, expression of the same transgenes via the Cha enhancer that identified CNS cholinergic neurons or postsynaptic muscle enhancers, have no effect on motor synapse plasticity. One possibility that the negative data for the Cha enhancer reflects its low expression level is refuted by its documented ability to drive dominant negative transgenes at levels sufficient to induce a loss of function phenotype for the highly expressed shibire (dynamin) gene [25, 29]. Second, immunocytochemical analyses (Figure 1) provide strong evidence for AP1 function in motor neurons. Taken together, the data presented here provide new and important evidence to support a model in which AP1 regulates motor neuron plasticity through a cell autonomous pathway. Results presented here make the following points. 1. Fos and Jun are expressed in Drosophila larval motor neurons; this establishes that AP1 is appropriately localized for cell autonomous function in motor synapse plasticity. 2. Motor-neuron restricted expression of AP1 perturbing transgenes via several alternative Gal4 drivers results in previously described plasticity effects. 3. AP1 perturbation outside of motor neurons has little effect on NMJ plasticity. Together, these data substantially strengthen a model in which AP1 acts in a cell autonomous pathway that regulates CREB-dependent and CREB-independent aspects of NMJ plasticity [6, 8]. Drosophila strains were cultured as previously described [8, 30]. The wild-type Oregon-R strain has been maintained in the Ramaswami lab. The UASFos, UASJun and UASFBZ strains from Dr. Mariann Bienz have been previously characterized for roles in NMJ plasticity . The UASNlsGFP (encoding GFP tagged with a nuclear localization signal) strain was from the Drosophila stock center and the 2X-EGFP strain was from Haig Keshishian. Strains with C380, OK6, Cha and MHC enhancer driven Gal4 transgenes were from Vivian Budnik, Brian McCabe, Toshi Kitamoto and Corey Goodman respectively. UAS-FLP is from the Bloomington Stock Center and actin<raf<nLacZ flies were obtained from Veronica Rodrigues and have been described in . Males from transgenic (driver) lines expressing Gal4 under control of the various enhancers, were crossed to virgin females from strains (responders) homozygous for the following transgenes: UAS2XEGFP, UASNlsGFP, UASFBZ, UASAP1 (UASFos;UASJun). Female larvae carrying both the Gal4 and Gal4-responsive transgenes were analyzed. These were compared to female progeny from crossing Gal4 driver males to wild-type Oregon R virgin females. For examining CNS expression larvae were dissected in standard HL3 ringers and fixed in sodium phosphate buffer containing 0.1% Triton X-100 and 4% paraformaldehyde for one hour at 4°C. Preparations were washed 3 times for 10 minutes each in phosphate buffer (0.1 M Na2HPO4 and 0.1 M NaH2PO4) and incubated in appropriately diluted primary antibody overnight at 4°C. This was followed by 6 washes of 10 minutes each with phosphate buffer and incubation in Alexa dye (Molecular Probes, OR) conjugated secondary antibody for one hour at room temperature. Finally, the preparations were washed 6 times again in phosphate buffer, then once in normal phosphate buffered saline (PBS) and mounted in vectashield (Vector Labs.) on superfrost charged glass slides (VWR) for confocal microscopy. Laser scanning confocal microscopy was performed on a Nikon confocal microscope. Maximum projections were generated from stacks collected with a spacing of 1.5 μ in all cases. Images were further processed for presentation using Adobe Photoshop. Embryo histochemistry was according to standard procedures as described in "Drosophila, A Laboratory Manual" by Michael Ashburner, CSHL Press. Larvae were anesthetized by chilling on ice for 3 to 5 minutes, and then, they were pinned with dorsal side up on Sylgard-coated (Dow Corning Co., Midland, MI) petri dishes containing HL3 saline . Larvae were dissected along the dorsal midline. The gut, salivary glands, fat bodies and trachea were removed. For retrograde labelling of the motoneurons, one or both side nerve branches innervating the fifth or sixth abdominal segment were isolated in a petroleum jelly pool to allow the uptake of dye (5% w/v rhodamine-dextran-3000 kD in distilled water; Molecular Probes, Eugene, OR.) . The rhodamine-dextran-labeled preparations were stored at room temperature (RT) for a maximum of 1 hour, in the dark. Preparations were fixed in 2.5% formaldehyde, 3% sucrose, in PBS, pH 7.3, for 2–5 hour, at RT, in the dark. The preparations were washed in PBS after fixation and mounted in 50% glycerol in PBS. Voltage clamp was performed as described previously (Sanyal et al, 2002). Briefly, larvae were dissected in HL3 ringers. Both the voltage sensing (10–15 MΩ) and current injecting (5–10 MΩ) were heat pulled fiber filled glass capillaries. Excitatory evoked junctional currents (EJCs) were recorded in the TEVC mode using an axoclamp-2B amplifier. The holding potential was -70 mV for all recordings. EJCs were recorded from muscle 6 in abdominal segment 2 following a supra-threshold stimulation to the innervating motor axons at 1 Hz. Mean EJC amplitude was determined by averaging 20 sequential EJCs. Spontaneous events were also monitored for a period of 50 seconds. The mean mini-EJC (mEJC) amplitude was calculated from these traces using the mini-analysis software http://synaptosoft.com. Statistical analysis including graphing and test of significance (paired t-tests) were performed in Sigma Plot (Jandel Scientific). Quantal content was calculated by dividing the mean EJC amplitude by the mean mEJC amplitude. We are grateful to Dirk Bohmann for antibodies against Fos and Jun as well as AP1 transgenic strains. Thanks to Stefan Thor, Vivian Budnik, Brian McCabe and Toshi Kitamoto for Drosophila strains and useful insights. The antibody to Drosophila elav developed by Gerald Rubin was obtained from the Developmental Studies Hybridoma Bank developed under the auspices of the NICHD and maintained by The University of Iowa, Department of Biological Sciences, Iowa City, IA 52242. Thanks also to Carl Boswell for confocal microscopy and the Ramaswami laboratory for discussions and comments on the manuscript. The work was funded by NIH grants DA13337 and NS34489, and grants from the HFSPO, McKnight and Alfred P Sloan Foundations to MR.
SS carried out the immunohistochemistry for the C380 and Cha-GAL4 experiments and all the electrophysiology in this study. RN carried out the immunohistochemistry for the OK6 experiments. CC carried out the dye fills in the C380, nls-GFP animals. Both SS and MR conceived of the study and participated in its design and coordination. SS and MR drafted the manuscript. All authors approved the final manuscript.